Everything changed for Brian when Sherry moved in next door. That summer Brian finally took an avid interest in yard work. Out of pure coincidence, when Sherry was sunbathing in her backyard, Brian would find the energy to mow and trim, unbidden by his parents. Being a good neighbor, he would offer to do the same for Sherry. In the fall, he raked leaves with the same vigor, and in the winter, he shoveled the driveways. Brian always offered the same to Sherry. Sure, he was only a seventeen-year-old high school boy and she was a nineteen-year-old student nurse, but she treated him like an adult. She’d invite him in for coffee – like adults. They would talk – like adults. He couldn’t make out the words on the other side of the door, but at least they were talking. He lost sense of time, but he could not get up the courage to press the doorbell. He had always knocked on the door, but today was different. He felt someone was watching him, and turned to see old Mrs. Baxter standing on the sidewalk with a questioning look on her face. As if there was any doubt what he was doing there, standing with a bouquet of beautiful blue roses. Only yesterday, he had debated about buying her a dozen roses, but knew if he didn’t make his intentions known in some fashion they might never be together. “Anybody home?” Mrs. Baxter called from the sidewalk. He didn’t know how to answer, turned and in panic pushed the doorbell. He heard the chimes and a thump inside. His brain said run, but he was suddenly frozen in place. The door opened and Sherry’s surprised look made him regret this whole approach. He noticed her wet hair and white bathrobe. This was totally bad timing for sure. Her smile made him realize he hadn’t said a word. “I’m sorry I disturbed you. These are for you, Happy Valentine’s day.” He pushed the bouquet at her, and spun on the stoop. He stuffed the bouquet in her mailbox and crossed her yard to his. He threw the screen door wide and stormed into the storage closet. For several minutes, he rummaged through the buckle of bins and jars. He began to calm, but the hatred resurfaced. He resumed his work. He saw a bull of a man exit her house, with Sherry on his heels. He turned and kissed her deeply. She giggled and spun back towards the porch, yelping playfully as he slapped her rump. The “bull” entered his car, and cranked the ignition. Brian could feel pieces of hot debris shower him even from the second story of his house. The blast was deafening. Sherry ran out into the yard and collapsed onto her knees, crying. Brian clambered down and offered his shoulder to cry on. After all, that’s what being a good neighbor is all about. Brian couldn’t ring the doorbell. He would be too embarrassed if Sherry laughed at him for asking her on a date. The cool car and the voices inside probably meant she had Valentine’s Day plans. Backing off her porch, he leapt over the perfectly trimmed hedge covered with fresh snow. Hiding under the snow was a forgotten concrete garden gnome. The bouquet of roses he wanted to give Sherry flew from his grasp. Each bud a vivid blue against the pure white snow. Brian tried desperately to stand and run into his house but the pain was too great. Sherry came running and noticed the flowers of blue scattered over the snow. “I’ll be fine tomorrow.” Brian smiled through the pain. Brian was devastated hearing she was leaving; maybe she would at least give him her pet. He just had to say goodbye to her, but before he could push the doorbell everything seemed to melt away. As the two of them approached Brian, he suddenly realized he was standing there naked in what looked like some sort of brightly lit laboratory. Sherry came up to him, and took his hand and said, “There, there, my little pet; we will have you back home safe and sound very soon.” She leaned over and kissed him on his forehead, and Brian passed out. Brian awoke on his back in the middle of a large field. As he laid there he saw the underside of what looked like a Trans Am lifting off above him. Suddenly, he realized it was a giant heart shaped saucer as it vanished into the night sky. He stood up and discovered two things: first, he was standing in a giant heart shaped crop circle; second, he really was naked. Brian entered the porch and stomped the snow from his boots. Sherry’s voice quavered through the open door. “The child is infatuated with you.” A different woman spoke in a doubtful tone. Brian clenched the bundle of flowers in surprise. Sherry had barely spoken of her studies. Having none of his own, Brian had not considered what career plans Sherry might have had. Brian’s grip tightened around the vase of blue roses as Sherry’s doorbell inexplicably emanated a palpable energy that quickened his pulse. His blood pressure soared as his finger continued to hover. The systolic screamed “no” while the diastolic directed him to follow his desires. A high-pitched ringing filled his ears. When it stopped he heard only a conversation from inside the house. He’d heard enough. Everything within Brian screamed “no” so violently that he tripped as he turned to run. Pain shot through his wrist as the bottom of the vase broke his fall on Sherry’s walkway. He was inside his house before he realized a piece of the vase had broken off. 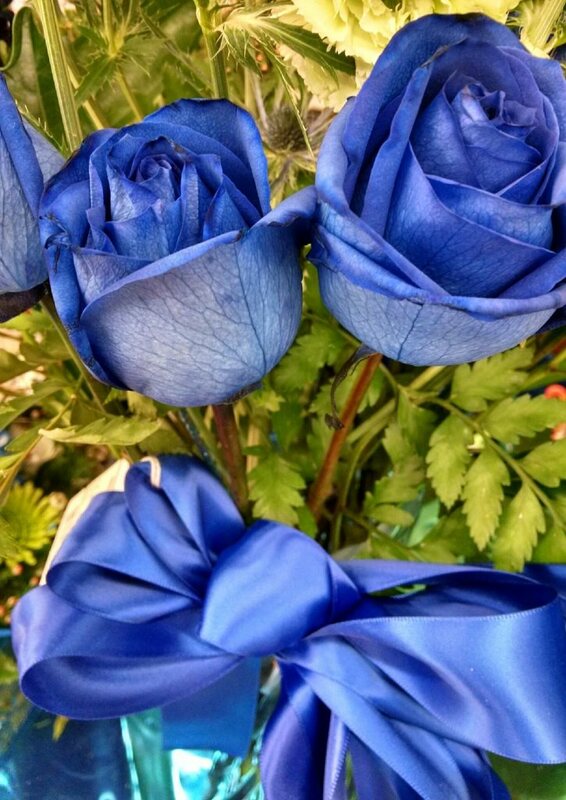 As Brian scraped vegetable peelings into the trash, he noticed his injured wrist was turning blue while the blue roses had turned unmistakably black. When he grabbed his phone, it emanated a palpable energy that quickened his pulse. Brian hesitated. He leaned closer to the door, struggling to make out some of the words that were being said. He’d never heard mention of a significant other from Sherry, but it was Valentine’s Day. Even if it wasn’t a boyfriend, Brian certainly didn’t want to barge into the middle of a conversation and declare his love for Sherry. Brian paused for a moment; footsteps sounded, heading towards the door. He leaped off the porch and scrambled over a nearby hedge, scattering leaves and flower petals. The door opened and the voices became audible. He snuck a quick glance over the hedge and groaned audibly as he saw Sherry and a tall, well-built college student exchanging a deep kiss. He felt angry heat sear his body. Sensations flashed on and off all over his body; the soreness of his back after mowing the front lawn he knelt on now, the pain of the cut he had gotten while trimming the hedges he was hiding behind, all reminding him of the long hours that had led up to this moment. “Hold on, I think I left my coat in the bedroom,” the man said. “I’ll come with you,” Sherry giggled. Brian knew he was acting irrationally, but hatred consumed his thoughts. 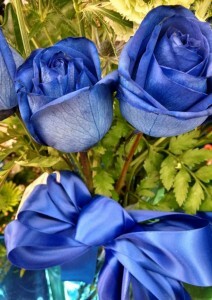 He grasped the neck of the flower vase, shook out the remainder of the blue roses, and sprinted to the black Trans Am. He knelt behind the car and smashed the vase, scattering sharp shards of glass behind the wheels.